A dumb but fun action movie that starts off a little slow, but picks up some major speed once it gets going. This is a quality B movie, which is a strange statement to be making about any film. Sure, it’s not the smartest movie out there, and it has ridiculous action scenes, but the movie is certainly a good deal of fun. Whatever plot holes don’t make sense also do not in any way take away from the film. we’re too busy watching Arnold tear things up and walk all over everybody to really care. The story might be routine, but the action scenes are all a lot of fun. and while the plot isn’t anything special, it does move smoothly and lead John Matrix (Arnold), from one target to the next, kind of like the best Daniel Craig Bond movie, Casino Royale. This one isn’t nearly on the same level as that, but it is still enjoyable and good for some entertainment. 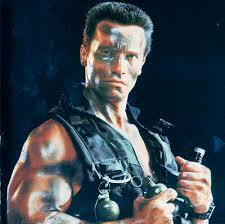 Commando is a very cool 1980s action movie. It is actually one of Arnold Schwartnegger’s better films, coming at a time when action movies were simpler minded and when stunts were done for real, as opposed to on computers. The movie has a pretty simple plot, but that’s completely fine. The action is fun, the story moves at a solid pace, and those are really the only things that count with a movie like this. You don’t try to compare commando to great movies. I try to compare it to other B action movies, such as the Steven Segal and Van Damme movies from the nineties or the Jason Statham movies of today. Compared to any of those films, from either decade, commando definitely proves to be the best of the bunch. The movie doesn’t start out as anything worthwhile at all. In fact, in it’s opening scenes it comes off appearing to be a pretty lousy film. That’s because the movie starts off with a scene or two of Arnold’s character, John Matrix, spending lovey-dovey time with his daughter (a young Alyssa Milano.) then we get a scene of Matrix’s former commander showing up at his cabin, arriving in a helicopter, to break the news that other members of his former team have been murdered. Sounds like the first Wolverine movie, right? Even when the action does start, it’s pretty lousy. The commander gets in his helicopter and flies off and about second later guys start popping out of the bushes, firing away. The action happens so quickly and so out of nowhere, that it feels like it’s part of the same scene as what we just saw, with the commander coming to visit. So first, we are watching the scenes with matrix and his daughter, wishing it was more exciting, and then when we do get action, it is still handled poorly. Luckily things get much better. They start to improve a little when matrix jumps in his car and rides it down a steep hill, even though there are no breaks and the vehicle seems to be mostly running on gravity. Matrix has to push it over the side of the hill just to get the car moving, and once he does, there seems to be no stopping it. This action scene is actually pretty good, and the start of things to come. I like that the crazy stunt Matrix is pulling here doesn’t result in his success. The movie would be a little too ridiculous if it had, and instead, his car ends up totaled and he finds himself a prisoner. The guys who kidnap him and his daughter work for a crime boss, played by Dan Hedaya with a foreign accent. The team of villains that Hedaya has hired to do a job for him are being headed up by one of Matrix’s former team members, a man named Bennett, who apparently Matrix disgraced and kicked off the team. Now this is starting to sound like the plot of the movie S.W.A.T. With Sam Jackson. The movie is starting to get better here, but it still isn’t anything great. It doesn’t actually reach it’s full potential, or even start to reach it, until matrix boards a plane, accompanied by a man who is going to take the flight with him and oversee that he gets to a foreign country. The idea is that he has to kill this foreign leader, and if he does that, then the bad guys will let his daughter go. I started thinking here that matrix was actually going to have to go to that country, deal with the man he was supposed to kill, and then come back to take on the bad guys. It seemed like he wouldn’t be back on U.S. soil until the second half of the film. That’s when Matrix attacks. He lashes out at the guy on the plane with him and then makes an amazing escape from the plane, right as it is taking off. This is the kind of scene that is totally ridiculous, of course, but still looks fantastic and is incredibly fun. I believe Wesley Snipes had a similar scene in Passenger 57, where he boarded the plane this way. Both scenes look great because they are done for real, with real actors and real planes, instead of the way movies would absolutely do it today with computer effects, drawings of a plane, and incredibly fake looking images. Matrix somehow manages to track down the other guy who brought him to the plane and follows this guy through a parking lot. He then uses the woman who this guy was harassing, rips out a seat from her car (awesome), and has her follow the guy to a mall where Matrix can attack him. The mall scene is terrific. Not only does matrix have to deal with this guy, but also a whole slew of cops who come after him. At one point, Matrix even swings across the entire mall on a curtain, and it all looks great. The rest of the movie becomes about matrix tracking down the bad guys, one at a time, and following the clues to find his daughter. Every new villain leads to another, and each one has to be handled carefully. There’s a big fight scene, for example, that takes place in a hotel room, between Matrix and his future predator costar, bill duke. I like that the whole time Matrix is tracking these bad guys down, using one clue to connect to another, the plane he was supposed to be on is still in flight. He has until that plane lands to get to the villains, because once it lands, they are going to find out that he was never on board. 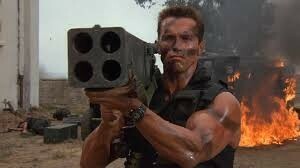 Commando is a very cool movie. I’ll always know it as the movie where Schwarzenegger fires a giant rocket prism-shaped rocket launcher on his shoulder, but as it happens the movie has a lot more things going for it too. The ending, for example, is a giant shootout with Matrix taking out an army of guys who are all firing at him, and the whole thing is beyond ridiculous, (especially since Matrix isn’t taking cover, but standing out in the open), but even still, it’s a lot of fun. This is definitely a B movie and not a super smart film, but as far as B movies go, it’s one of the better ones. Just watching Arnold lift, push, and tear things apart as if they are pillows, is pretty cool. From a car seat to a telephone booth to pushing his car off the side of a hill, this movie is all about having fun.